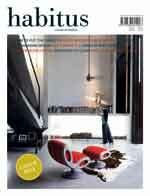 In Habitus 26, we take time to look at The Art of Lounging, in spaces and products. In this vein, for our photo shoot, Amanda Talbot re-imagines Picasso’s summer home at Sydney’s historic Elizabeth Bay House. Among much more, we visit Kennth Cobonpue’s home in Cebu, speak to Elliat Rich about her Urban Billy project and discover the beauty of copper mixing with salt at a home in Coogee, Sydney. 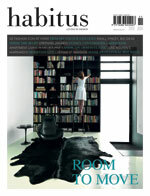 In Habitus 25, we consider the spaces in which memories are created, in a photo shoot that follows the journey of life. Wedrop in on Brian Parkes in Adelaide, Shane Thompson in Brisbane and meet Nott, a timber fanatic in Thailand. Then step aboard as we sweep the Region for design and architecture innovation and inspiration. DIn Habitus 24, we urge you to PLAY – an activity crucial for enjoyment, brain development and creativity. Meet people doing interesting things – fashion designer Roopa Pemmaraju, artist Sopheap Pich, furniture retailer Michele Chow of Dessein, and Bobby Dekeyser of Dedon. See how people live in design across the Region, and find inspiration for living in small spaces. 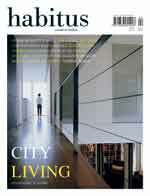 Dive into Habitus 23, a fresh and thoughtful look on living in design. Join our feasting table, where we focus on the social and playful elements of dining, in a setting that could have been painted by a Dutch master. Meet Archibald award-finalist, James Powditch in his inner city home, fashion icon Jenny Kee and Thai businesswoman Korakot Srivakorn. We also visit a special project that brings together architecture, social responsibility and the culture of the indigenous Orang Asli people in Malaysia. Then discover a young architect’s version of Mies van der Rohe’s Modernist Pavilion, and another floating pavilion-style structure inspired by Regional design. Head to Malaysia to see how an international couple have made a ‘spec house’ their own and to Hawaii to see how Pete Bossley has translated his signature approach into a new landscape and climate. Lastly, an apartment in Bronte by Tribe Studio Architects shows that good things come in small packages. All of this, plus a special feature showing innovative ways to use space, texture and the element of surprise in the humble bathroom. And we discover the pearly passion of one of Australia’s most successful family brands – Paspaley. 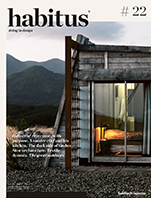 Habitus 22 brings you inspiration for the end of the year – relax, rejuvenate and restore. Meet quirky Thai designers 56thStudio, and discover New Zealand industrial designer Ross Steven’s best creation – his own home, made completely out of repurposed materials. Plus, chef Mark Best shows us around his inner-city apartment in Sydney. Then take a trip to Tasmania to an idyllic home built around a 120-year-old Oak tree. Duck over to Jakarta to see an architectural gem, and then to Jamberoo in Sydney’s south to learn about the dark side of Australian timber. There’s a house with a (wonder) wall to be explored in Chiang Mai, and a home in Perth that is built to the principles of Slow Architecture. All of this, plus an outdoor living special featuring projects and a review of recent books, as well as a look at New York-based textile company, Maharam. 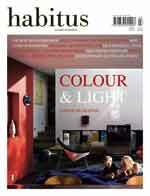 It’s all about the inspirational in Habitus 21. From Vietnamese-born fashion designer, Alistair Trung, to one of the doyens of Australian abstract painting, Sydney Ball, Habitus finds that passion comes in many shapes and forms. And in ourfirst instalment of our new ‘All in the Family’ section, we find that Italian kitchen brand, Boffi, has maintained their passion for great design over generations. Explore a host of other inspirational living spaces across the Region, from a re-worked terrace in inner-Sydney, to a family home in Bangkok, and a beachside inspired masterpiece in Queenscliffe. And we look at the unobtrusive heroes of the home, those items that we touch every day but rarely notice – taps, wallpaper and drains. 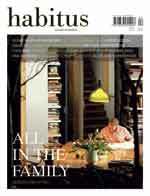 Habitus 20 finds inspiring people from all walks of life. From radio funny man, Tim ‘Rosso’ Ross, to Melbourne University’s Professor of Architecture, Philip Goad, Habitus 20 discovers that a passion for good design and architecture can be found in the most unlikely places and people. We also visit the Sri Lankan city of Galle to find two Australian architects have achieved one unique vision, that Filipino artist Olivia D’Aboville has reinvented old tapestry textiles in new and innovative ways, and that a small New Zealand apartment can be the perfect multi-generational family home. And from rugs, to heating and coffee machines, we find that the best new pieces for your home come from just around the corner, again proving that the Region really does have the best there is to offer. 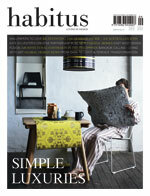 Habitus 19 features a full harvest of stools, tables, lights and coat racks, ripe for the picking. And we look at the unobtrusive heroes of the home, those items that we touch every day but rarely notice – taps, handles and switches. We visit Mika Nishamura of Artika International, in a home that’s perfect for her Japanese/Australian family, plus rising young Filipino furniture designer, Vito Selma in the Philippines, and the founder of Qi Activated products in Bangkok. As always the Region offers both inspiration and innovative solutions for the home. Find out how you insert a completely demountable structure inside an old church in Sydney, put a 5-storey house on the side of a cliff, and fit a couple into a 67-square-metre apartment. 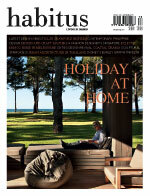 In Habitus 18, enjoy a photo shoot that asks: what do you do when you have some time to yourself? To coincide with the holiday season, we also look at how to get packed in style for a range of getaways. As well, meet creative personalities at home, including eminent Australian architect, Alex Popov, at his 17th Century farmhouse in Mallorca. Plus visit Studio Juju in Singapore and discover the intriguing work of Indian artist, Subodh Gupta. Explore a host of inspirational living spaces across the Region, such as a light-filled terrace, an unusual copper-clad structure, a bach with sensitive allusions to the site’s Maori past and a home that achieves “perfection, without being too perfect”. 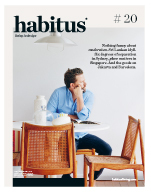 In Habitus 17, enjoy a photo shoot that celebrates the return of outdoor dining weather, plus beautiful products for spring cleaning, the latest stationery and cutlery, and furniture, lighting and technology for Living in Design. As well, meet creative personalities at home, including Brazilian-born, Brisbane-based Alexander Lotersztain, and meet Indian-born, Amsterdam-based designer Satyendra Pakhale. Plus explore a host of other inspirational living spaces across the Region, such as a photographer’s warehouse home, a modern addition to a heritage-listed house, a Singapore family residence that is open to the elements, and a working vineyard that is home to a New Zealand couple. 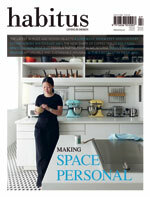 There’s a multitude of ideas and ways of living in our projects section this issue. From a family dwelling rebuilt after the Victorian Black Saturday bushfires, a clever and compact inner-city home in Sydney, a spacious retreat in India, or a modest cabin in the mountains, there’s something for everyone. 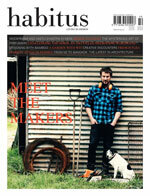 The second issue of the re-designed Habitus will touch down on 28 March. Check out a gravity-defying photo shoot, as well as a host of international design products and the latest items for the bathroom from Italy’s Cersaie fair. We meet the brother-sister duo behind Melbourne fashion label, Alpha60, passionate art promoter, Shalini Ganendra in KL, textile doyenne of Sri Lanka, Barbara Sansoni and her photographer son, Dominic, and Singapoorean interior designer, Angelena Chan. Visit some amazing houses around the Region for inspiration on how to make the most of what you’ve got. Whether faced with restrictions on space, views or anything else, innovative solutions can be found. We also wander around the heel of Italy’s boot in Puglia and discuss where the suburbs are headed. 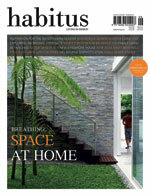 Welcome to the new-look Habitus designed by graphic design studio one8one7. In an engaging, refreshed layout, we bring you the same flavour of unique Habitus stories to enjoy. First, be inspired by the latest and greatest design products for the home. We had heaps of fun putting together storage ideas and our pick of illustrated fabrics, mobile phone technology and accessories, and a tasty selection of items for coffee and tea drinkers. We’d like to share our Portraits of Design Hunters from the Region. Enter the homes of NZ architect Davor Popadich, Thai ceramicist Somluck Pantiboon, and Funkis creative, Carina Enstrom-Gibb. Also check out amazing collection of art in Sydney’s White Rabbit Gallery and a new trends in Teak furniture by Indonesian company, d-Bodhi. On Location, we travel to Singapore, New Zealand, and Malaysia, as well as Perth, Sydney and Melbourne, for a look at diverse designed ways of life. Then visit Helsinki, the World Design Capital 2012 and get thinking with a few recent books. 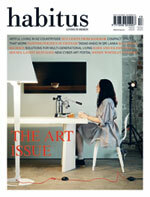 Explore creative worlds in Habitus 13, from the global products inspiring Design Hunters everywhere, to a look at the hottest pens and pencils, and furniture in the context of art. This issue we discover the world of New Zealand ceramicist, Kristin Peren, meet Bangkok-based Angus Hutcheson of Ango Lighting, and creative partners Adam Cruickshank and Amber Ward in Perth. Then we get political with Vietnamese artist Pham Huy Thong and explore art online with NZ portal, Ocula. 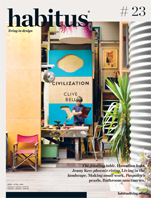 Ideas for living are found in all of our project stories this issue, including the new modernism in Bali, a stately Tadao Ando house in Sri Lanka, a space-efficient ex-motorcycle workshop in Sydney. We also learn how John Spatchurst places a life’s worth of collectables, antiques and art in his home with a graphic designer’s eye, and wander through the home and gardens of Wendy Whiteley. You can pick up your copy of issue 13 in good newsagents and bookstores, including Magnation. Or Subscribe to future issues here. We dive into design in Habitus 11, beginning with a selection of international products, the new wave of coat hangers – and rejoice as colour makes a comeback. In this issue we get excited by reinventions of the traditional chandelier, and discover contemporary products and forms in bamboo. Whether in the hills of New Zealand, on remote Stradbroke Island in Queensland or the plains outside Mumbai, homes across the Region respond to the climate, landscape and cultural traditions to create environments that embody unique ways of life. As well as global design objects and furniture in Design News, Habitus 09 shows the potential of humble cardboard in many forms. Also enjoy the product shoot (featured on the front cove! ), with the latest comeback element for the home – wallpaper. A home in Thailand becomes a gallery of the resident’s experiences and enjoy our first Philippine houses, showing two interpretations of combining old with new for contemporary living. 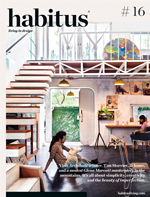 In issue 08, Habitus brings you the latest in beautiful design products from around the world, along with a dedicated photo shoot on ideas for lighting. and discover Adelaide illustrator extraordinaire, Dan McPharlin. and the home of a creative couple in India. This issue, as well as covering the latest design objects, Habitus puts the spotlight on the coffee table and looks at ideas for soft flooring. The regional inspirations of photographer, Simryn Gill and Indian architecture hero, Rahul Mehrotra. 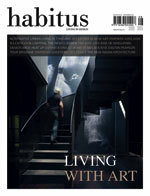 Habitus 06 encompasses living in design, bringing you diverse stories from the Region. In the Philippines and Malaysia traditional techniques meet modern materials in the work of furniture designer, Ann Pamintuan, and textile/fashion designer, Edric Ong. Across the ditch, New Zealand art gallery owner, John Gow, opens up his home and art collection for us and we see how architects, Mitchell Stout, design for town and country living. 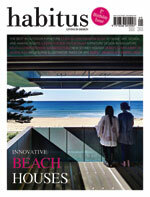 Habitus celebrates its first birthday this issue, with plenty of exciting content. Visit art foundation owners, Dr Gene and Brian Sherman at home in Sydney. and fly to Paris with Korean-born, Philippine-based textile designer, Eun Il Lee. and the family home of New Zealand architect, Noel Lane. 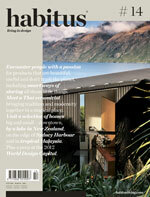 Habitus 04 brings together a diverse selection of personalities, this issue focussing on Australia and New Zealand. and the fine jewellery of New Zealand’s Joanna Campbell. We compare 2 very different projects by burgeoning Melbourne architect, Jeremy Wolveridge. 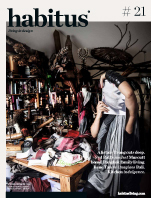 Indulge in Habitus Issue 03 as we explore the region for design hunters of all kinds. and we pay homage to New Zealand’s Marshall Cook. A suburban Melbourne house and 2 Queensland houses, including the spiritual home of artist, Tracey Moffat. 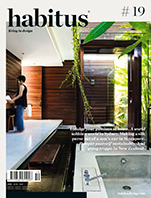 The second issue of Habitus includes conversations with New Zealand designer, David Trubridge, and Filipino Kenneth Cobonpue, and we look at the body of work of Malaysian architect, Kevin Low and Thai architect, Boonlert Hemvijitraphan. and we visit an artistic and cultural haven in Malaysia. A group of architects who are experiencing their own design and exploring the concepts of living together, yet separately. and some stunning architecture in Tasmania. 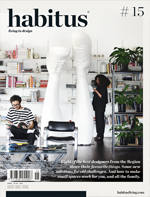 The pages of the first issue of Habitus are graced with a collection of diverse design hunters from the region. and we profile icons from South-East Asia such as Ernesto Bedmar and landscape architect, Ng Sek San. Waterfront properties and suburban living in Sydney and a shophouse in Singapore.